Posted in Brunch, on May 15th, 2009. Oh, are these a winner. Exceptional breakfast or brunch food. Easy. And amazingly delicious with the pesto and mozzarella, and the little cooked tomato, and the ham. Well, just everything about it is good. I read about this over at Proud Italian Cook, a blog I read regularly. Marie found it in a new cookbook called Gale Gand’s Brunch. Gale Gand used to have a series on the Food Network, years ago, called Sweet Dreams. She’s primarily a pastry chef, and owns (I think) the restaurant called Tru in Chicago. But, seeing a picture of these on Marie’s blog, I was smitten. I haven’t spotted this new cookbook yet, but may have to go check it out at the local bookstore. If this recipe is any representation of what’s in the cookbook, I’ll have to buy it! Here’s what you do: buy some thinly-sliced deli ham. At my Italian market, the big round ham was Black Forest. Perfect. You need fairly big (not thick, but big in diameter) slices of ham. The recipe indicated making these in ramekins, but Marie had altered it for muffin cups, which worked fine for my needs anyway. So, you butter the ramekins or muffin tins, then gently fan the ham slice in the muffin cup, pressing it out so there’s a nice big hollow in the middle (it’s a little hard to do this, but you don’t have to be precise about it). 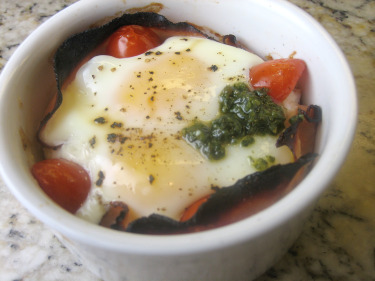 You smear a bit of pesto in the bottom, then add in a couple of nice-sized cubes of mozzarella cheese, a small cherry tomato, then crack in an egg. Sprinkle with salt and pepper, bake. The recipe indicated 20 minutes or more, but in a 350 oven (lower than the recipe indicated), when I did them it took 27 minutes. Just keep checking and jiggling the muffin pan a bit. Pull them out when they still jiggle just a small amount. If you wait until they no longer jiggle, they’re overdone. Once baked, you merely add another dollop of pesto on top. Serve immediately while they’re still perfectly cooked. The ham I bought was quite big, so you notice that the upper edges burned a bit. Next time I’ll trim them down. But I’ll definitely be making these again – great for a brunch with guests. It takes very little time to put it all together, and if you had another pair of hands, it would come together in a jiffy. Note added later: I made these again – for dinner one night. I still had two slices of ham leftover from the Mother’s Day brunch, and was able to put this together in no time flat. The ham worked much better in ramekins rather than the muffin tin. I also used 2 eggs each. I cut up the cheese in slightly smaller pieces and put them around the outside edges as best I could. I also used two tomatoes, both cut in half and stood them up with the cut sides against the ham (looked nicer), on opposing sides. Then I dropped in the pesto and the raw eggs. The eggs baked in slightly less time, but I removed them BEFORE they got too done. This was a winner the second time around. 2. Butter a muffin tin generously. 3. Fold the ham slice in half, then half again and place it in the muffin tin, then gently unfold it – fan it out – to create a cup/shell shape. 4. Place some pesto in the bottom and two cubes of mozzarella cheese and the cherry tomato. Try to put those around the edges, if possible. 5. Crack an egg into each ham cup, then sprinkle with salt and pepper to taste. 6. Bake for 20 minutes and check for doneness (jiggle the pan). Bake until the egg is done to your liking – may take up to 30 minutes depending on your oven. 7. 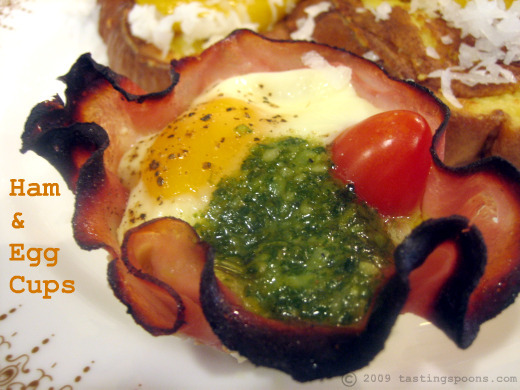 Place another dollop of pesto on the top of each egg and serve. Per Serving: 299 Calories; 23g Fat (69.3% calories from fat); 19g Protein; 4g Carbohydrate; trace Dietary Fiber; 264mg Cholesterol; 665mg Sodium. 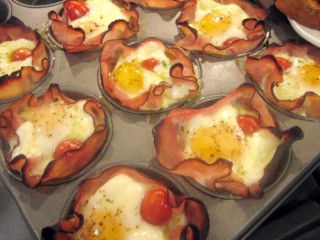 Beautiful job with your egg cups! Yes we both have those crispy edges. Aren’t they the cutest? I definitely need to get that book! Your photo’s look great, makes me think I want these for breakfast again! Thanks so much for the shout out, and a big thank you to GG.